JAMES, Author found in New Testament James grew up with Jesus as his half-brother so he was able to observe the actions and decisions Jesus made. 1 JAMES, Author found in New Testament James grew up with Jesus as his half-brother so he was able to observe the actions and decisions Jesus made. 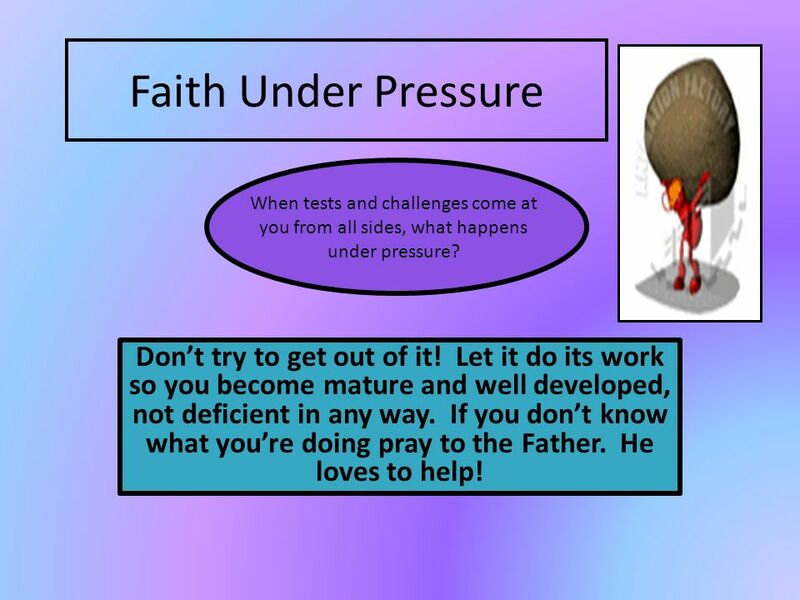 2 Faith Under Pressure Dont try to get out of it! Let it do its work so you become mature and well developed, not deficient in any way. If you dont know what youre doing pray to the Father. He loves to help! When tests and challenges come at you from all sides, what happens under pressure? 3 Prosperity is as long lived as a wildflower so dont count on it! As soon as the sun rises, pouring down its scorching heat the flower withers becomes a barren stem. As soon as the sun rises, pouring down its scorching heat the flower withersbecomes a barren stem! The Father will help, He loves to help! Ask boldly, believing. Keep all your options open! When down and outers get a break, Cheer! 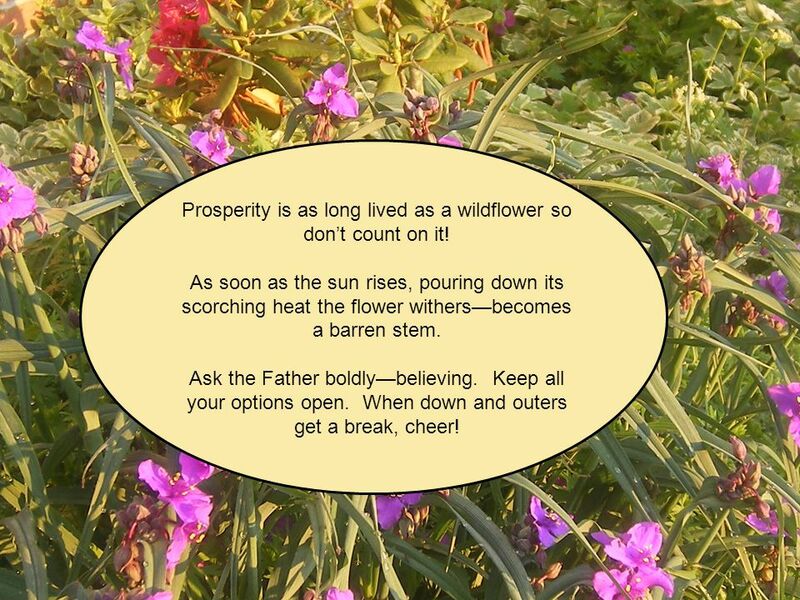 Prosperity is as long lived as a wildflower so dont count on it! As soon as the sun rises, pouring down its scorching heat the flower withersbecomes a barren stem. Ask the Father boldlybelieving. Keep all your options open. When down and outers get a break, cheer! 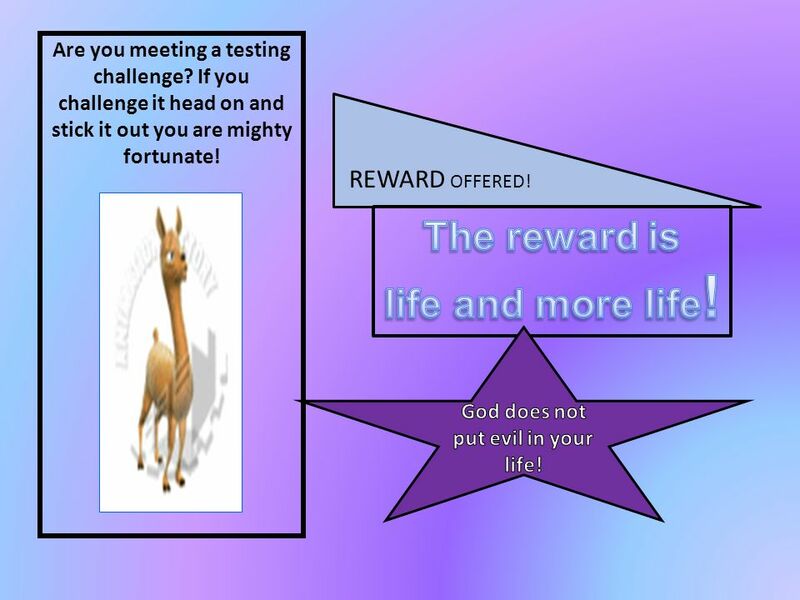 4 Are you meeting a testing challenge? If you challenge it head on and stick it out you are mighty fortunate! REWARD OFFERED! 5 The temptation to evil comes from us. We have no one to blame but the seducing lust that comes from our own lust. 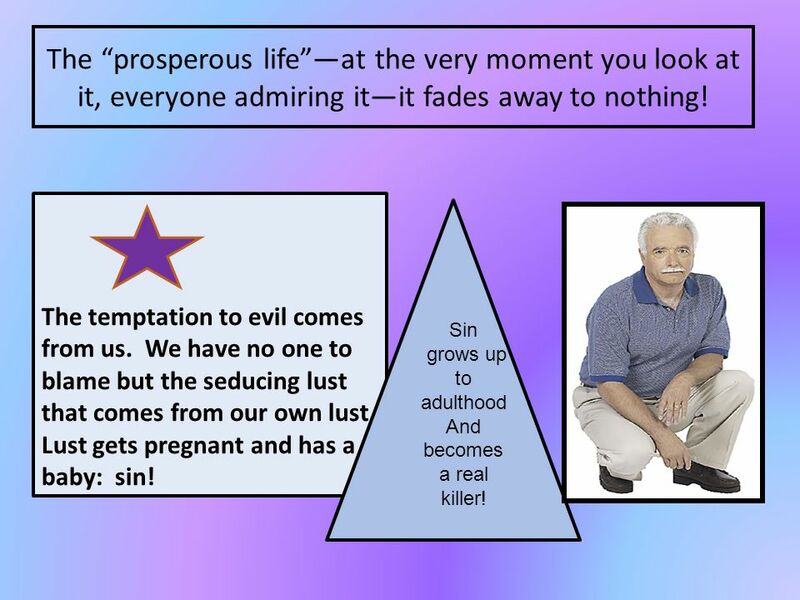 Lust gets pregnant and has a baby: sin! The prosperous lifeat the very moment you look at it, everyone admiring itit fades away to nothing! Sin grows up to adulthood And becomes a real killer! 6 Anyone who meets a testing challenge head on and manages to stick it out is mighty fortunate. Dont get thrown off course! Every good and perfect gift comes out of heaven. 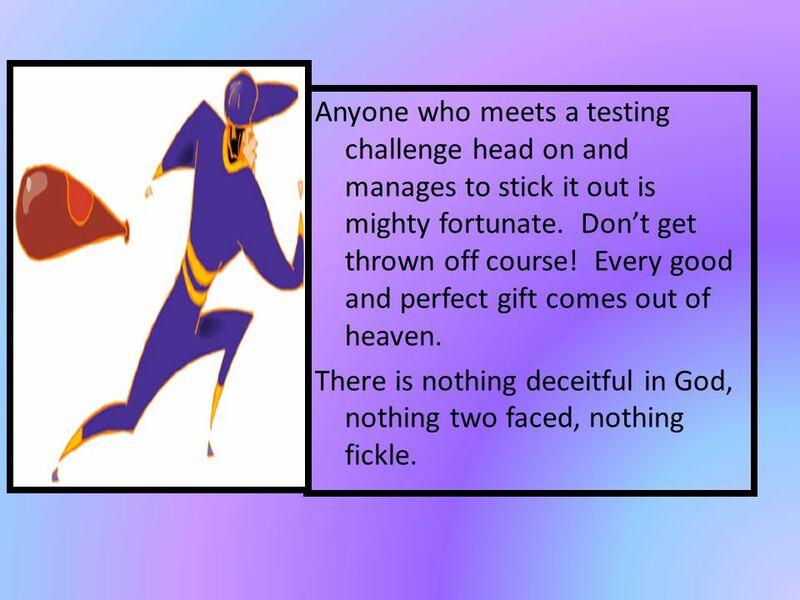 There is nothing deceitful in God, nothing two faced, nothing fickle. 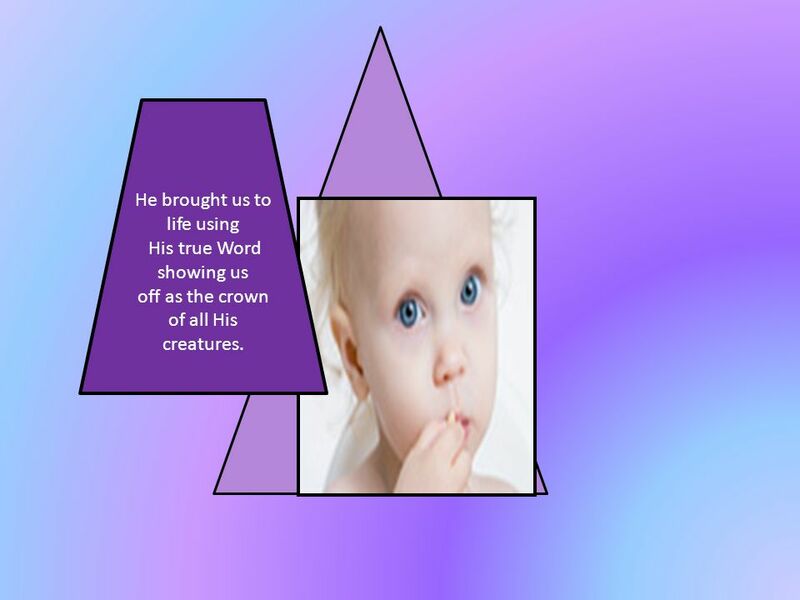 7 He brought us to life using His true Word showing us off as the crown of all His creatures. 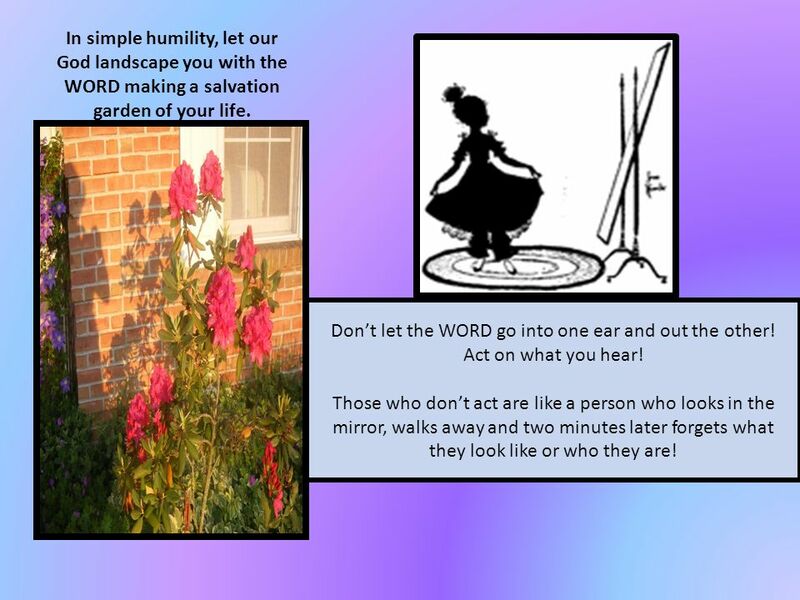 8 In simple humility, let our God landscape you with the WORD making a salvation garden of your life. Dont let the WORD go into one ear and out the other! Act on what you hear! Those who dont act are like a person who looks in the mirror, walks away and two minutes later forgets what they look like or who they are! 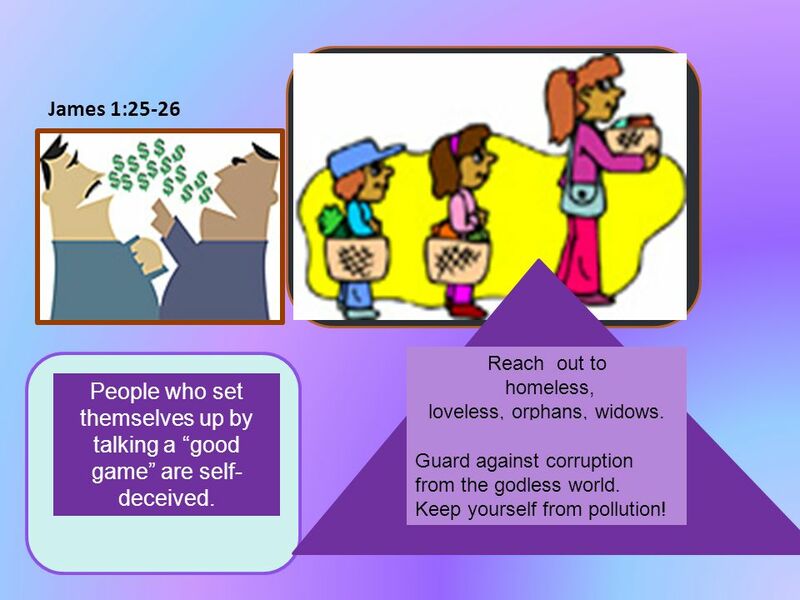 9 James 1:25-26 People who set themselves up by talking a good game are self- deceived. Reach out to homeless, loveless, orphans, widows. Guard against corruption from the godless world. Keep yourself from pollution! 10 Dont get thrown off course! 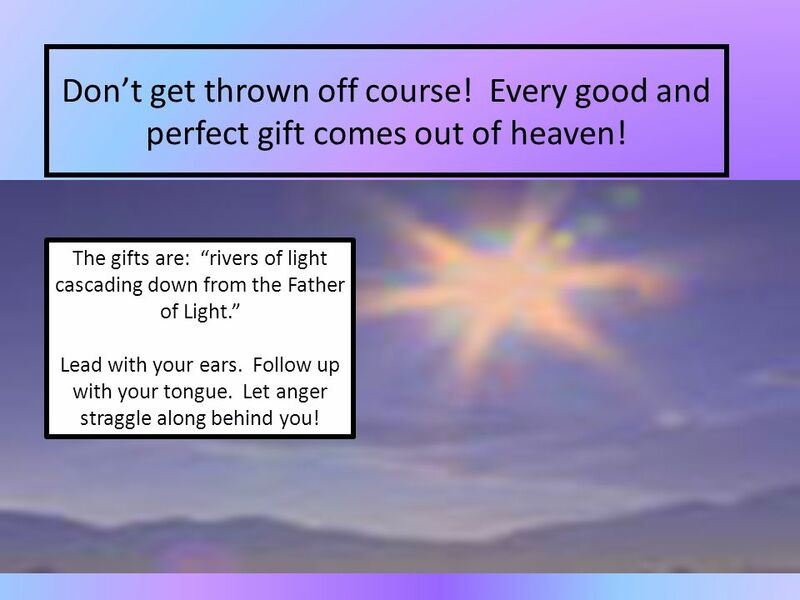 Every good and perfect gift comes out of heaven! The gifts are: rivers of light cascading down from the Father of Light. Lead with your ears. Follow up with your tongue. Let anger straggle along behind you! 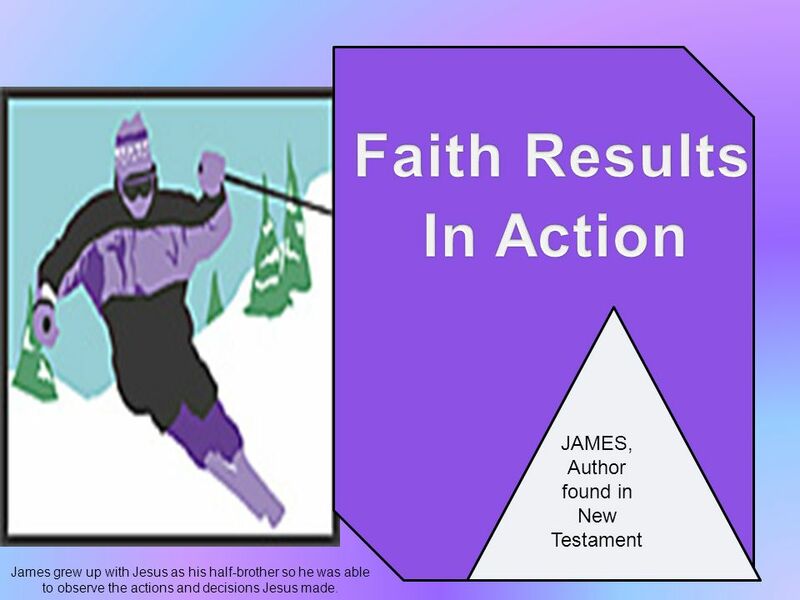 Download ppt "JAMES, Author found in New Testament James grew up with Jesus as his half-brother so he was able to observe the actions and decisions Jesus made." Lesson 4 for October 25, James 1:22-27 HEARING AND DOING Those who hear and do James 1:22 Those who hear but don’t do James 1:23-24 WHAT TO DO? Secrets to Overcoming Temptations. Secrets to Overcoming Temptations: Every Temptation is a Divine Test. James 1:2-12 “Consider is all joy, my brethren, when you encounter various trials, knowing that the testing of your faith produces endurance. And let. James Mythbuste r John Guenther, Penguin Baptist Church 24 October 2010. My dear brothers, take note of this: Everyone should be quick to listen, slow to speak and slow to become angry, for man's anger does not bring about. Sardis. Simple Truth Simple truth: Comfort will often lead to Complacency. 1© 2009 IBM Corporation The Epistle of James Christ Baptist Church Fall 2014. TEMPTATION. JAMES 1: Blessed is the man who endures temptation; for when he has been approved, he will receive the crown of life which the Lord. 1) Great gifts capture our attention because giving runs counter to our basic instinct: Getting. Two Types of People Who Respond to Trials “Real Life” [James] Series  James 1:12-15. Part 2. Seeing & Responding to People like Jesus Two foci for 2009 –Bringing people to spiritual maturity –Seeing & Responding to people like Jesus. Last meeting Ice breaking in a Sunday school class. Service is a must (St Luke 11:23 and St Matthew 12:30) I serve because I love. “ALL”..... in my life!